Lady Jardin - Vintage Views of the South Coast: The Sunday Best Campaign & Give-Away! Due to the lovely comments I've been receiving on digging out my Sunday Best, the thought came to me, why don't we try to start our own little campaign to spread the love of Stylish Sundays? I recently wrote about one of the problems I have with my wardrobe. I keep finding beautiful dresses in flea markets and boot sales, but cannot find an occasion to wear them. Too nice to wear for an everyday normal day, but not quite evening wear. So they started gathering dust at the back of my wardrobe, looking at me longingly, saying 'wear me! wear me!' but I can always think of a reason why they just wouldn't suit. Enough of the excuses I say, they deserve to be worn and seen, and why do I have to have a reason anyway? We all used to get dressed up in our Best for Sundays, every Sunday. I know I'm not the only one out there. I've had this conversation with the girls many times. These beautiful dresses shouldn't be hidden away any longer. Lets go back to those days gone by when everyone would dust off their best and bust it out for all to see on Sundays. So without further ado, for all you lovelies out there who expressed a want to do this yourself, why not spread the love. To mark this grand occasion, I have put together a little campaign poster for you to take away and stick up on your own blog, facebook or whatever tickles your fancy, and see how far we can take this! 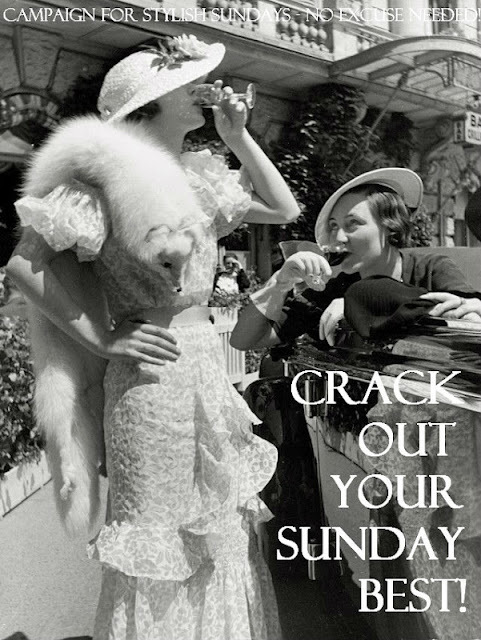 Let me know if you post up pictures of any of your Sunday Best ventures, as I will be having a monthly round up of anyone who decides to participate. To get you started, and to also celebrate a personal milestone of 90+ followers, I'm combining the launch with a home-made Give-Away prize! For your consideration we have 2 prizes up for grabs. I have put together some fascinators which are looking for a new home. Home-crafted and featuring feathers, crochet edging, pom-pom's and flowers, I think these would make the perfect topping to any Sunday Best outfit! On to the rules of the game. I shall try to keep it quite simple, not done this before! The condition of giving away two are: 0-10 entries = 1, which the winner may choose or 10+ = both, so 2 winners. 1. Comment below that you want to take part, and please mention which one you'd prefer! So join me fellow bloggers! Whatever motivates you, lets bring back the wearing of our Sunday Best, and let's see how far we can spread this! What a great idea! My Grandma always used to say buy something because you love it and the opportunity to wear it will present itself! I'll wear false eyelashes and an evening dress to shop at Lidl, it cheers everyone up! Forgot to say, it's open to all (including you Dario! if you win, you may use it for whaterver you wish :) as long as you share the photos! hehe!) and I will pick a winner at random next week on Monday, so get entering! Thank you all for such lovely comments, they really really make my day! Popping into town with the biggest grin on my face now!! Participating!! I am sewing something new today since we still have time till the baby comes. I posted it on my Facebook page and putting the badge on my blog! This a GREAT idea! Oh count me in please!! I have already had a go at my Sunday best a few weekends ago (theres a post on my blog) so I will add your linky picture to my side bar straight away! Oh and my favorite is the one with the butterfly (naturally) though the are both gorgeous! As me and my sweetie only get get to see each other at weekends I always do my best to make sure I have saved the best outfits for then. Mind you when we eventually are able to see each other more often I will need more 'best' outfits. Time for more fabric shopping perhaps.